Camryn Bennett, a twenty-year old who thinks she knows exactly how her life is going to turn out, decides after one out of control night at a bar in Raleigh that she needs to escape and search for a new destiny. Once she makes up her mind she grabs her purse, cell phone and boards a greyhound bus headed towards anywhere away from her life in North Carolina. It's on this road trip that Camryn meets Andrew, who is not only good looking but lives his life with no regrets. In no time these two forge a friendship, which of course blossoms into more. Andrew is instrumental in helping Camryn find herself and fight for what she wants out of life, but when Camryn learns Andrews secret will it tear them apart of pull them together? How can I even begin to explain my love for this book?? When I first read this book, back in December 2012, I hadn't been really reading much and seeing it was on sale bought this book on a whim. I thought why not give it a whirl! That same day I had lunch with my best friend, told her about it and she also bought it. We started reading The Edge of Never that afternoon at work (Don’t judge us, we know you all do it too!) and we were immediately drawn to Andrew and Camryn. This book takes you on the road trip of your life, where the characters are so much fun to read about. We both literally laughed out loud, cried like babies and just were so sad when it was over! Further evidence this book was special were the constant text messages and phone calls back and forth as we worked our way through the pages of the story to discuss what was going on with the characters and what we thought or hoped was going to happen next. This book is responsible for making us obsessed with reading again. 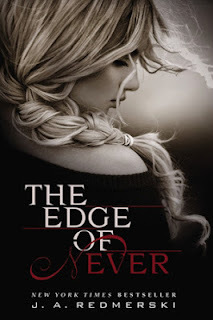 I cannot wait until the sequel The Edge of Forever is released later this year. J.A. Redmerski has an unbelievable talent for making you fall in love with the characters and every aspect of this book is excellent from beginning to end. She also has some fabulous paranormal romance books The Dark Woods trilogy, which hooked me in as soon as Ian Somerhalder (Damon on the Vampire Diaries) was referenced. Needless to say they just got better from that point. Pick up all of her books, they are all really good, captivating stories that once you start you aren't going to want to put down.